Note : Before you think of Cell Selection - Cell Selection is the procedure that happens when Cell Detection/Search procedure were successful and complete. So when you try to test or troubleshooting Cell Selection step, you have to prove from UE side log that Cell Detection/Search procedure were successful and complete. The cell power criteria described in this page (in 3GPP as well) is determined only by P-CPICH power, you have to think of another signal power (PSS, SCC power and quality) which UE has to detect even before detecting P-CPICH. This is not all. In purely based on 3GPP criteria, P-CPICH detection may be good enough for cell selection, but when it comes to testing if Cell Selection is successful or not, we normally use Registration (or at least PRACH transmission/Reception) as a success criteria. So if you think of this factor, additional channel power/quality (P-CCPCH, S-CCPCH etc) should be considered as well. Therefore, I would like to say the completion of cell selection in terms of testing would involve much more factors than those described in this page. There are two types of Cell Selections. "Initial Cell Selection" and "Stored Information Cell Selection". Definition of these two methods are described as follows in 25.304 5.2.3 Cell Selection Process. This procedure requires no prior knowledge of which RF channels are UTRA carriers. The UE shall scan all RF channels in the UTRA bands according to its capabilities to find a suitable cell. On each carrier, the UE need only search for the strongest cell. Once a suitable cell is found this cell shall be selected. This procedure requires stored information of carrier frequencies and optionally also information on cell parameters, e.g. 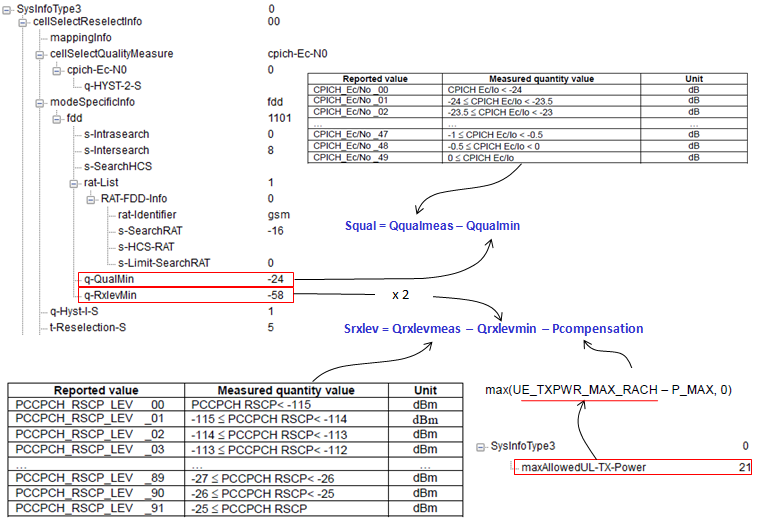 scrambling codes, from previously received measurement control information elements. Once the UE has found a suitable cell the UE shall select it. If no suitable cell is found the Initial cell selection procedure shall be started. For a cell to be selected, they should meet a certain criteria as follows. (In FDD) For a cell to be selected, both Squal and Srxlev should be greater than 0 and these two values are calculated as follows. Squal > 0, Srclev > 0. So The UE will select this cell. Squal > 0, Srxlev < 0. So The UE will not select this cell. If you want to let UE to perform Intracell search all the time, the easiest way would be to set as follows. Followings are System Information Block messages that are related to Cell Selection/Reselection. I enabled IEs as much as possible just to show you all the usable IEs. You may not see many of these IEs in real deployment. Which IE and values are used are completely up to each network operators. You may think Cell Selection (or Reselection) would be relatively easy to troubleshoot, but in reality it is not simple at all. First, not so many people has clear understanding of the cell selection criteria itself. Even though you have clear understanding of all these 3GPP details, there are technical issues that make this troubleshooting difficult. The first step for the troubleshooting is to guarantee / verify the following two factors. Item ii) is relatively easy comparing to item i) if you have UE side logging tool and skill to analyze the log very in detail. The problem is item ii). Usually Cell Selection test is done in very low power. One of the most accurate way to verify the signal quality of any transmitter is to use Vector Signal Analyzer and measure EVM or CDP(Code Domain Power. See some example ). But the problem is that none of the vector signal analyzer (as far as I know) can decode/analyze the modulated signal at such a lower power level (e.g, under -100 dBm). Technically, if you have very good quality of amplifier with high dynamic range, you can use it to amplify the signal from the network and then put it into spectrum analyzer. But in reality it would be difficult to use such a complicated setup for day-to-day troubleshooting. Therefore, in real life of UE testing.. if you don't have detailed UE logging and the skills to analyze them, the troubleshooting process would be almost completely like 'matter of luck'. ii) Check if UE log successfully print out PSC (Primary Scrambling Code) and see it matches the PSC of the NodeB that you want the UE to select. v) Check P-CPICH power and quality meets the cell selection criteria (To do this, UE needs to successfully decode SIB3 at least.) Usually, most of UE log would print out Squal and Srxlev value if you set proper filter in the logging tool so you don't have to calculate them manually. vii) If UE successfully decoded the necessary SIBs, it should send PRACH. If UE does not send PRACH even at this condition, it is UE side protocol issue or sometimes I saw some UE manufacturer put some hard limiter in such a way that UE does not send PRACH under a certain value regardless of cell selection criteria. viii) If UE has sent PRACH with proper power and NodeB (or Test equipment) fail to detect it, then network side debugging should be done.